Here’s the sure cure for CIRCUIT PARALYSIS! Need to learn circuit analysis but experiencing some resistance in your brain waves? No stress! Circuit Analysis Demystified will give you the jolt you need to understand this complex subject–without getting your circuits crossed. In the first part of the book, you’ll learn the fundamentals such as voltage and current theorems, Thevenin and Norton’s theorems, op amp circuits, capacitance and inductance, and phasor analysis of circuits. Then you’ll move on to more advanced topics including Laplace transforms, three-phase circuits, filters, Bode plots, and characterization of circuit stability. 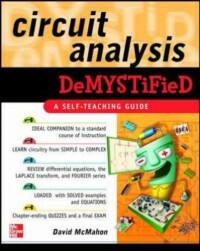 Featuring end-of-chapter quizzes and a final exam, this book will have you in a steady state when it comes to circuit analysis in no time at all.